Building on our last Color Consistency Tests, I thought I'd test the flash duration of some of the flash units we own and use with our new Sekonic L858D-U flash meter, since the new meter not only allows HSS and HS metering, but also has an exciting "Flash Duration Analysis" mode that records and displays flash duration data for your strobes. Further, the flash duration can be displayed in t0.5 AND t0.1 times, or anything inbetween, if you prefer. There doesn't seem to be a lot of definitive information on flash duration out there with manufacturers quoting different flash duration times with differing methods of measurement, so I hope this is of some help for those looking for this sort of information. Speedlights were used bare, at a 50mm zoom setting. 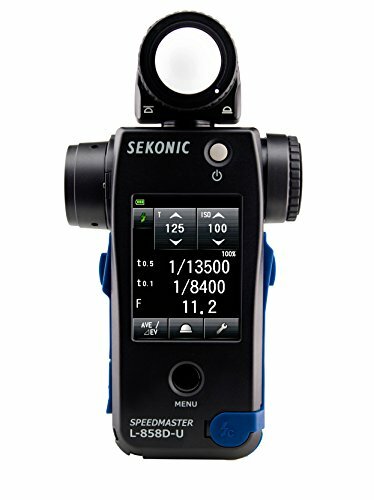 Since Sekonic does not currently have modules that can trigger Profoto or Broncolor receivers, Each flash was triggered in the "corded" mode by using a PC-sync cord into each flash unit tested. The lumisphere was in the retracted postion. While it can display any flash duration measurement you want, I configured the L858 to display t0.1 times since these times are the most useful for photographers wishing to stop motion with their strobes. While most quote t0.5 times for the purpose of more impressive marketing, at t0.5 only half the flash pulse has been expended, leaving the other half of the light — which is still contributing toward your exposure. At t0.1, 90% of the flash pulse has decayed, and is the most accurate representation of a flashes' motion-stopping power. To ensure consistency between results, I took at least 5 readings at each power level (in full stops) from full power of each unit down to the minimum power available. I then took the mode from all recorded thousandths-of-a-second fraction readings to track most consistent result. Since the Sekonic L858D-U also converts the fraction reading into a millisecond/microsecond (μs) reading, I recorded each of the millisecond/microsecond readings and averaged them for a mean result, though most don't often speak of flash duration in those terms/units. Flash units with different "modes" for optimal/shorter flash duration, such as "speed", "freeze" or "action" modes were tested in both modes. Because of the limitations of Squarespace's graphing capabilities, and because Excel doesn't play nice with fractions, I elected to display the graphed results in microseconds (μs), to give the best visual representation of decreasing (shorter) flash durations through the power range of each strobe for the purposes of illustration and comparison. The tables below each chart display the flash duration in the more common thousandths-of-a-second (fraction) and microseconds (μs) for each full-stop of power available on each unit. Read on for the results from each flash. I got to test the oldest in the Scoro line, the A4S, at a recent Broncolor demo day; it should be noted that the pack was a rental pack, and I was told as the tube ages, it can have an effect on the flash duration. I was told that the flash duration is calculated based on the flash tube's age, voltage being returned to the pack....and all sorts of things I can't begin to understand fully. In any case, the pack performed very well and came very close — or in many cases beat the displayed flash duration on the pack. For reference, I've placed the displayed or "calculated" flash durations in the table at the right. This is what the Scoro pack displays at each power level. I did not get to test the pack in the optimal flash duration mode (or "speed" mode, as Broncolor calls it). The crazy thing about the Scoro is you can tune the flash duration within a wide range of values, so if you wanted to induce motion due to a longer flash duration at lower flash power, that is entirely possible, and not something any other pack or monolight can do. In addition, the Scoro can tune the color temperature of the flash within a certain rangs as well, so as flash tubes age, or when using different brands of lights or different heads in color-critical work, you can cool or warm the output of each lamphead independently to match the rest. The Scoro has all sorts of other features like flash sequencing — Of course, you pay handsomely for all of this. 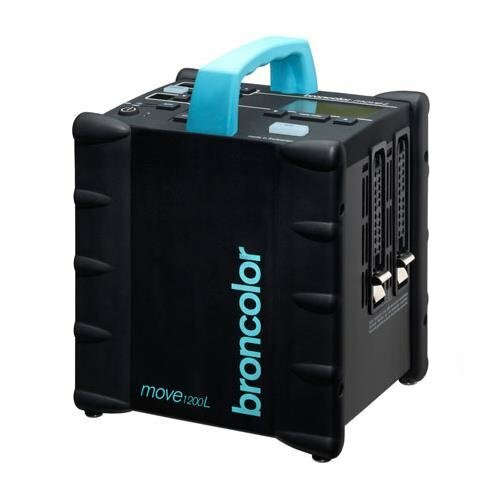 The Broncolor Move 1200L is known for being what almost amounts to a small battery-powered Scoro pack for both location and studio use. It takes a lot of its bigger brother's features and packs them into a small yet powerful pack (for more on how I use the Move 1200L, check out my guest post on the Hasselblad-Bron blog). The flash durations for the pack in the "normal" color-stable mode are impressive, but the pack also features a "speed" mode for shorter flash durations, increasing its motion-stopping capabilities. In "speed" mode, the Broncolor Move 1200L is limited to 1/2 power (600J) at the top end, and cuts the flash pulse shorter, enabling shorter flash durations. It also shortens the refresh time for sequential shots. This comes at the cost of color stability, as the pack cuts the power short. With regard to flash duration, marginal improvement is seen in the Move's "speed" mode. From 1/4 through 1/128th power, there is slight improvement, with the margin narrowing, as you get lower in the power range. Interestingly, the figures measured come quite close to the quoted t0.1 times displayed on the pack itself, so you can be confident that you're getting an accurate representation of what's displayed on the Move 1200L pack. The Move 1200L is extremely good in both modes, and while there is only marginal improvement in the "speed" mode as far as flash duration is concerned, things like shorter refresh time may be a reason to use the pack in this mode. Profoto — along with most other manufacturers — quote t0.5 times for more impressive numbers for marketing purposes. However, the Profoto B1's compare favorably and do very well at t0.1, as seen above. At full power, it seems like "Freeze" mode on the Profoto B1 doesn't do much (if anything at all), as the flash duration is just about the same as it is in "Normal" mode. However, one stop down at 1/2 power (in "freeze" mode), the flash duration is less than 1/3 of what it is in the "normal", color consistent mode. The trend continues into 1/4 power, and from 1/8 through to 1/128th power, the flash duration is about half of what it is in "normal" mode. At the lowest power setting, there is minimal change. 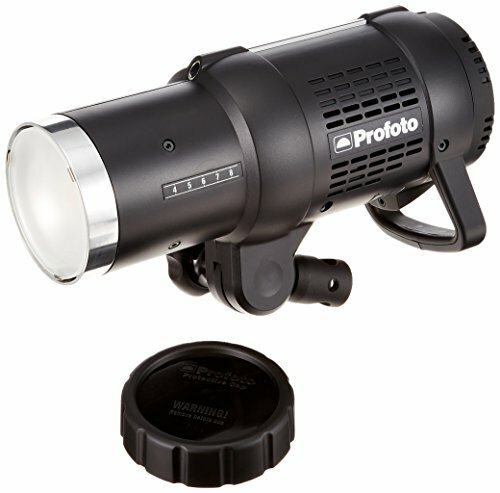 For supreme action-stopping power, however, Profoto does offer the D2 — the latest iteration of their AC Powered monologhts, and the successor to the D1. The D2 offers extremely short flash durations (up to 1/63,000 t0.5 at minimum power [2ws] on the 500Ws model), with the same high build quality of other Profoto products, along with TTL. 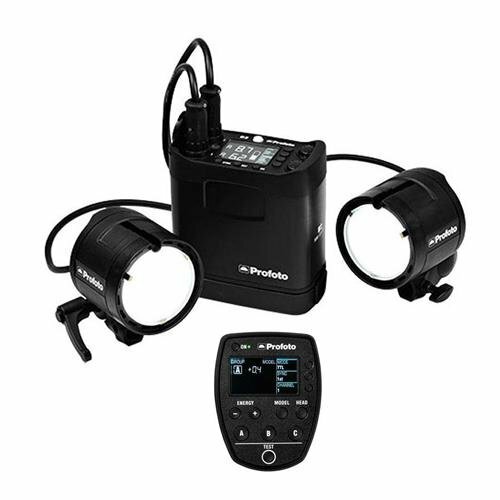 Profoto also offers the insane (in both price and performance) Pro-10, pushing 1/80,000 t0.5 flash duration at its lowest power (2.4ws). Interestingly, the flash duration doesn't improve all that much on the Profoto B2 when in "Freeze" mode — this may be related to the color consistency issue I experienced when I tested and retested it (this has apparently been addressed in the latest B2 firmware, which I have not been successful in loading onto my B2's). It's nearly exactly the same for flash duration throughout the power range, with only a marginal difference between 1/32 and 1/128th power. Similar to the B1's, it seems that full power in Freeze mode does nothing. While Profoto quotes t0.5 flash durations for impressive marketing, the t0.1 times are very respectable and in "freeze" mode, we can see that it quickly approaches and exceeds the flash durations of speedlights, while having a much more usable amount of light. Special thank you to my friend Michael Anthony in Japan for getting me these results from his D2 1000. Continuing the trend of the previous units, the Einstein E640 offers little advantage at full power in "Action" mode, with results starting to show at 1/2 power, where the flash duration is cut by about 30%. This improvement in flash duration continues throughout the power range, with the flash duration being about halved between 1/4 and 1/256 power. The Interfit EXD200s are some of my oldest strobes, and very inexpensive, at that (I think I paid about $300-400 for the 2-head kit about 10 years ago). It's interesting to see how the flash duration gets longer as you dial down the power, due to most flashes utilizing variable voltage to control flash power. This is in contrast to the rest of the lights in this list that are IGBT controlled, which "quenches" the power to achieve shorter flash durations. The Paul C Buff website has a great explanation of variable voltage versus IGBT controlled flashes. Additionally, the Interfit heads only have a 4 f-stop range for power adjustments, as seen in the graph. A very special thank you to John Moran from the fredmiranda forums for getting me this info from his Canon 600EX-RT. Speedlites are known for fast flash durations, due in part to their lower power compared to monoblocs and pack/head systems. The Canon 580EXII performs very well in this regard. Small speedlights like this would do well for tabletop or product photography indoors or in a small studio where youdon't need too much flash power and want to freeze things like splashes or impact (breaking glass, etc). A very special thank you to John Moran from the fredmiranda forums for getting me this info from his Canon 430EXIII-RT. As a clone of the Canon 580EXII, The Yongnuo YN560III speedlite performs about on par with the Canon offering, and marginally better at 1/32 power and lower, possibly due to being slightly less powerful than the 580EXII. In the above graph we can see that the Broncolor Move 1200L pack is faster at equivalent powers than the rest of the strobes tested. However, at lower powers of 30WS and below (1/16th power on the Profoto B1 and PCB Einstein, and 1/8 power on the Profoto B2), things start to even out. Of note here is the Godox/Flashpoint AD600 unit performs very well in the middle power range, besting the flash duration(s) of the Profoto units at a similar power.